The guide was written by Agnieszka Bukowska and Krzysiek Rzyman, who, on a daily basis work with CoffeeDesk and STOR cafes. They both travel a lot and whenever they plan another trip, they look for local cafes and coffee roasters. Coffee is not only a drink, it’s also an opportunity to talk, to get to know new people and discover the city from a completely different, non-touristy perspective. Coffee Spots Polska is a bilingual guide, written in Polish and English so it will help both Polish and foreign coffee lovers crossing the country. There are already over 170 places in Poland serving highest quality coffee and preparing it with pour over methods. Drip, chemex, and siphon are not only effective but most of all, they help to get the very best from the coffee beans. The guide describes cafes from the high North to the deep South, from Szczecin and Gołdap, located near the border with Kaliningrad, and from Gdynia to Zakopane. It is no surprise that the majority of the cafes are based in Warsaw. Next come Poznań and Kraków. We were also positively surprised by the offer at many smaller towns. The calmest café is located in the Bieszczady Mountains, an excellent hideaway for few days. The most inspiring one is in an ancient photo studio in Raciborz, near the Czech border. Apart from the practical information like the opening hours or the equipment and the brewing methods, the guide also describes the story of each of the place and its owners. 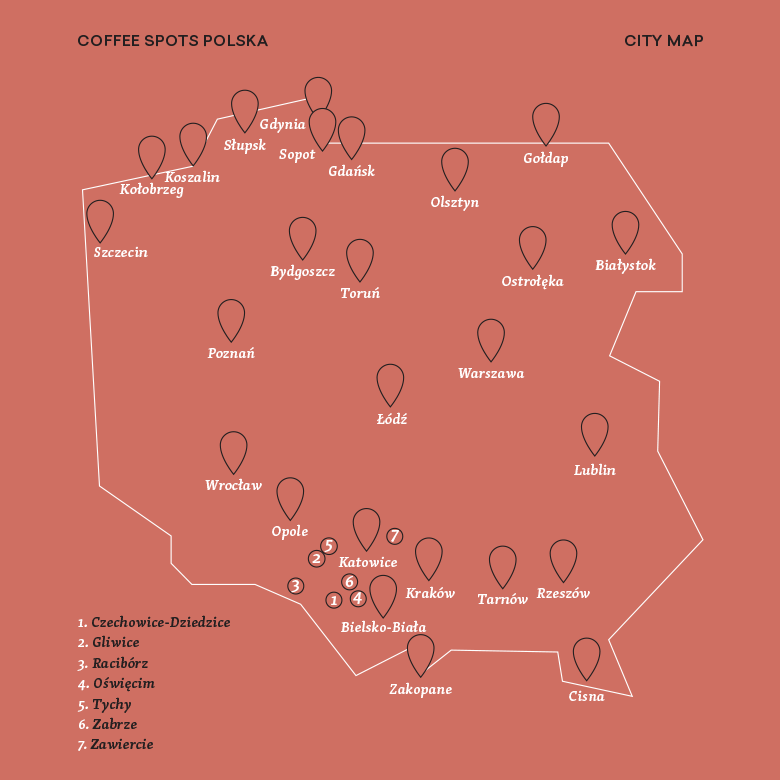 Coffee Spots Polska is truly a compendium of speciality coffee knowledge. Specialists from Poland and abroad were invited to contribute to the project and write chapters about the countries of coffee provenance, processing methods or brewing. The co-authors are Maciej Duszak – Polish Brewers Champion, Krzysztof Barabosz – co-founder of Hard Beans roasters, Marcin Rzońca – author of popularcoffee.pl blog, Kuba Świątek – Head Barista and coach and Scott Tedder – green beans buyer and roaster at Bonanza Coffee from Berlin. Serving coffee is no less important, food blogger and journalist Małgorzata Minta reminds about it in a text dedicated to Polish porcelain. Finally, activist Areta Szpura argues that #suckingsucks and encourages the cafe owners and coffee drinkers to embrace zero-waste lifestyle. 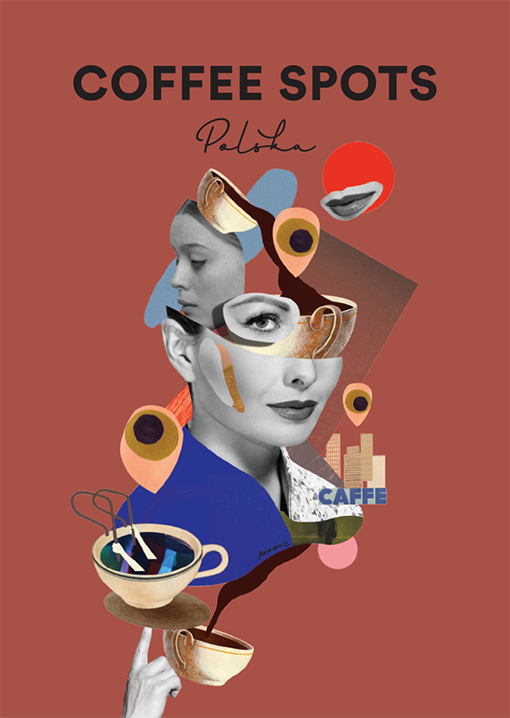 The collage on the cover of the guide was designed by Beata Śliwińska Barrakuz, designer, illustrator and set designer. You can buy the guide at www.coffeespots.pl, in the cafes described in the guide, independent bookstores and in the online store CoffeeDesk.pl.